If you're like us and are just coming back to work from a long weekend (or even if you're not), chances are you'd rather be almost anywhere else than in your office right now. But wouldn't working from a fabulous office perched high above the trees or an awesome prefab pod workspace (right in your backyard) ease some of the pain? Click through our gallery to check out some of our favorite eco offices that are better than bland cubicles any day. This colorful workplace is so creative that you might never guess that it’s home to Infrax, a Belgian utility provider. And it isn’t just green on the outside. Designed by Crepain-Binst Architecture, the building has green technologies that successfully reduce its energy load by a whopping 40% of code. 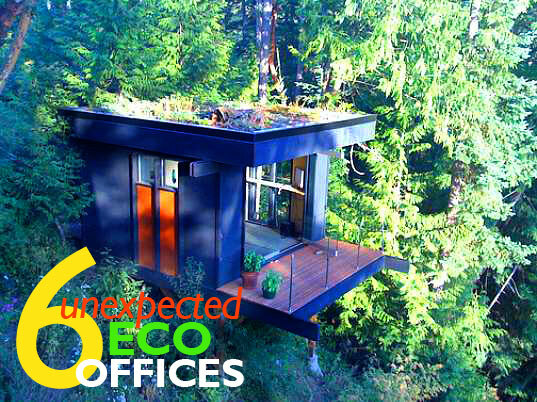 What’s better than having a sweet prefab eco office? Having it right in your backyard! OfficePOD is a modern prefabricated workpod that centers its philosophy on the fact that more and more people have begun working remotely. The space has everything you need to maintain a separate workspace away from distractions but with all of the eco benefits of not having to commute. If you’re looking to take your career to new heights, how about putting your office on stilts? That’s what the architects behind this Nunnmps office in Chicago did in order to minimize the project’s footprint and preserve the site’s natural state. Two thirds of the building is underground and the rest is perched up high on stilts! If you don’t want a major case of office envy, look away now. 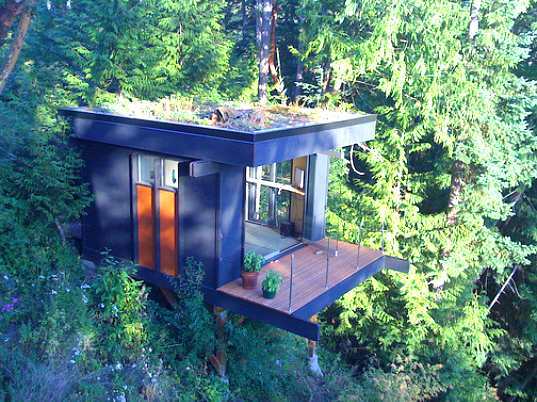 This incredible workplace is one of a kind, perched high above the forests of Chuckanut Bay in Bellingham, Washington. Peter Frazier, a customer experience consultant, built the lofty space after gaining over 50 pounds while working at his regular office. We’re sure that getting up to this treetop space every day probably helped him shed some poundage. Seeing the beautiful craftsmanship and smart design of this lovely eco office, it’s hard to believe that it was designed and built by students! 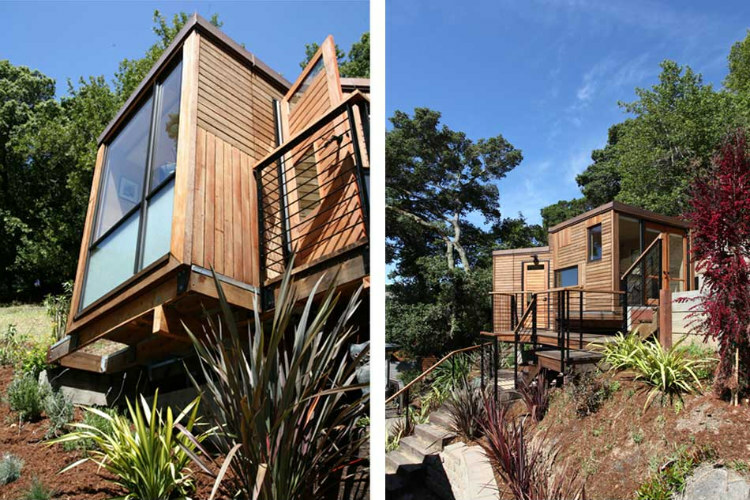 That’s right, attendees of the California Academy of Art were responsible for this amazing prefabricated outdoor office which uses recycled and reclaimed materials – and they even took home a citation from the East Bay AIA for the impeccable design. 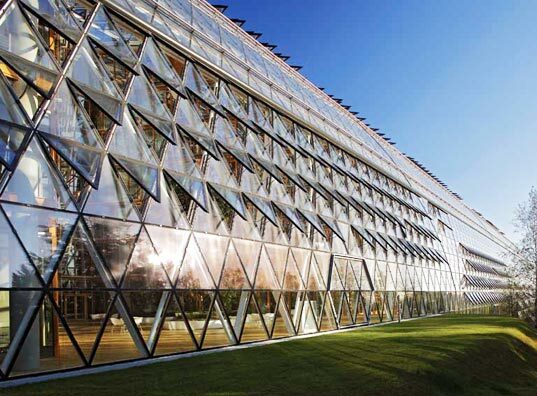 This gleaming home to the European Investment Bank in Luxembourg certainly doesn’t look like your everyday average office building. The glass-cad exterior, environmentally conscious and energy-efficient design and office layout that promotes interaction and communication took first place in the Emilio Ambasz Prize for Green Architecture for International Buildings. Designed by Düsseldorf-based Ingenhoven Architects, the innovative building has both winter and summer gardens and has achieved a rating of “very good” under the UK’s Building Research Establishment Environmental Assessment Method (BREEAM). These are really incredible, we hope to share with you our green office spaces as well as homes and resort upon completion of The Resort at Isla Palenque, a Panama island property we have been planning for and working on for two years now - while camping out. All of our design will be sustainable and integrated into the jungle scape - hello working from paradise. Thanks for the inspiration as always. I think this new idea that combines the office with design and going green is very fascinating. 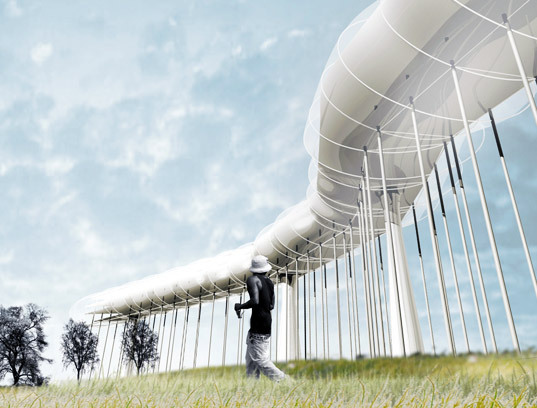 This concept could take going to work to a whole different level and the fact that it also involves being eco-friendly and energy efficient, gives the entire trend more purpose. VIBRANT BELGIAN ECO OFFICE IS GREEN OUTSIDE AND IN This colorful workplace is so creative that you might never guess that it's home to Infrax, a Belgian utility provider. And it isn't just green on the outside. 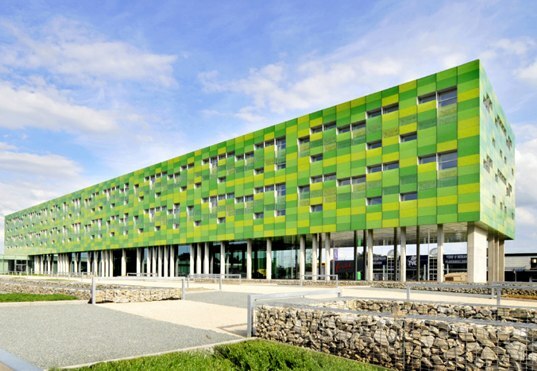 Designed by Crepain-Binst Architecture, the building has green technologies that successfully reduce its energy load by a whopping 40% of code. 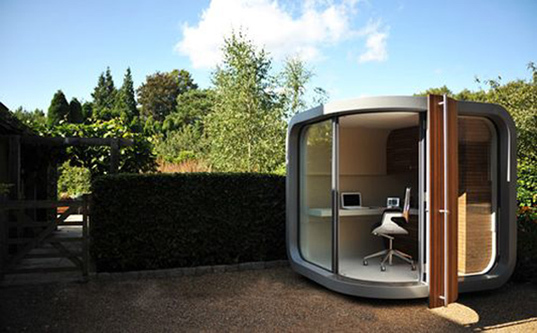 OFFICEPOD: A PREFAB CUBICLE FOR YOUR BACKYARD What's better than having a sweet prefab eco office? Having it right in your backyard! OfficePOD is a modern prefabricated workpod that centers its philosophy on the fact that more and more people have begun working remotely. The space has everything you need to maintain a separate workspace away from distractions but with all of the eco benefits of not having to commute. NUNNMPS OFFICE ON STILTS! If you're looking to take your career to new heights, how about putting your office on stilts? That's what the architects behind this Nunnmps office in Chicago did in order to minimize the project’s footprint and preserve the site’s natural state. Two thirds of the building is underground and the rest is perched up high on stilts! BEAUTIFUL STUDENT BUILT PREFAB OFFICE Seeing the beautiful craftsmanship and smart design of this lovely eco office, it's hard to believe that it was designed and built by students! That's right, attendees of the California Academy of Art were responsible for this amazing prefabricated outdoor office which uses recycled and reclaimed materials - and they even took home a citation from the East Bay AIA for the impeccable design. TREETOP OFFICE WITH INCREDIBLE VIEWS If you don't want a major case of office envy, look away now. This incredible workplace is one of a kind, perched high above the forests of Chuckanut Bay in Bellingham, Washington. Peter Frazier, a customer experience consultant, built the lofty space after gaining over 50 pounds while working at his regular office. We're sure that getting up to this treetop space every day probably helped him shed some poundage. GORGEOUS GLASS-CLAD OFFICE BUILDING IN LUXEMBOURG This gleaming home to the European Investment Bank in Luxembourg certainly doesn't look like your everyday average office building. The glass-cad exterior, environmentally conscious and energy-efficient design and office layout that promotes interaction and communication took first place in the Emilio Ambasz Prize for Green Architecture for International Buildings. Designed by Düsseldorf-based Ingenhoven Architects, the innovative building has both winter and summer gardens and has achieved a rating of “very good” under the UK’s Building Research Establishment Environmental Assessment Method (BREEAM).